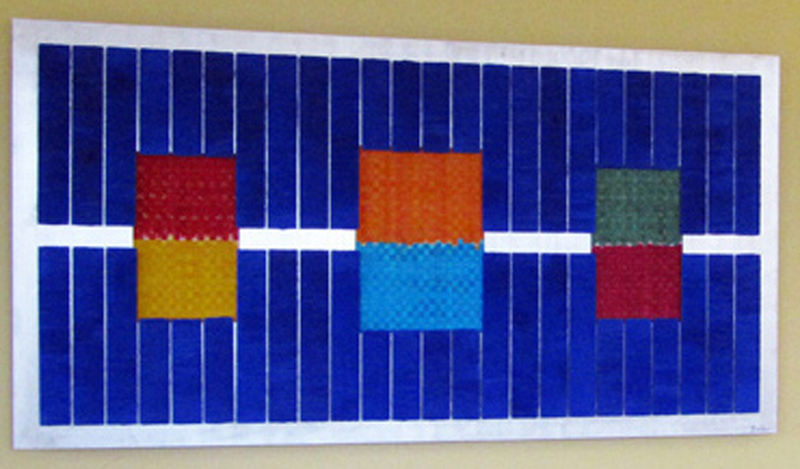 We asked Barbara Zander to write about her new silk constructions for Evergreen Medical Center. Art can transform a space, evoke an emotion, tell a story, spark a memory or inspire hope. I experienced this recently while working on two silk constructions for Evergreen Medical Center. Art is an integral part of Evergreen They had recently completed two new buildings in Redmond and Woodinville, Washington and they wanted art for each of these buildings. They also wanted the Evergreen staff and public to have a part in the creation of the art so they would feel a connection to the new buildings. The design accepted for Woodinville is called “River Of Hope”. 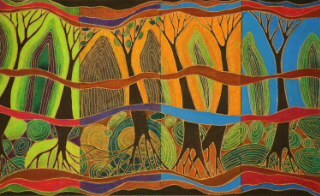 It has a “river’ meandering through the abstract piece. “Threads of Hope” is the name of the Redmond art. That clinic serves people from all over the world and Evergreen wanted that reflected. Threads seemed to tie everyone together. 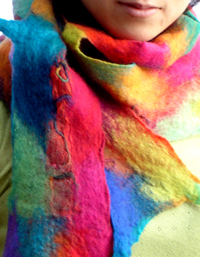 For the public part of both pieces I dyed yards of silk ribbon.. I constructed small looms for the ribbon. Each building had two open houses for the staff and public. At each event staff and public were asked to write on the ribbon what hope means to them. Messages ran the gamut from hope for cures for cancer, health for their families, thanks to Evergreen for providing hope to their children’s names. Particularly poignant were the messages of hope for the victims of the Japan tsunami which had just occurred. After writing their message each person could weave their ribbon into the larger piece. As we all know, art speaks volumes and these two projects definitely proved that. There were long lines waiting to write their messages. 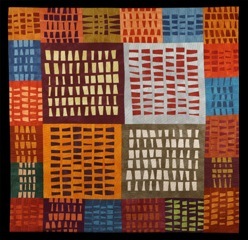 I then took those weavings and began to incorporate them into the final construction. Both constructions have hand-dyed and arashi pleated silk in panels that surrounded the weavings. The silk is mounted on textured aluminum. Each 70” x 36” construction contains 400 individual pieces. The art was installed in May. Next to the art are the names of each person who contributed to the piece. And do take a moment to see her youtube videos about her process. Janet Steadman has been busy………. Janet’s three small quilts, Learning Why, Why 2, and Why 3 have been selected to be in the High Fiber Under Five 2011 exhibition and sale at the San Jose Museum of Quilts. For the past three years High Fiber has been a successful weekend benefit art sale created to generate support for both fiber artists and the Museum. 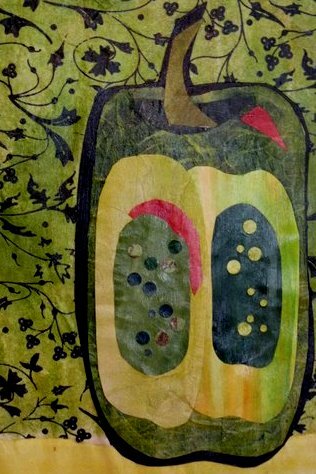 High Fiber showcases a variety of textile art forms including quilts, tapestries, sculpture, basketry, jewelry, wearable art, and mixed media pieces where fiber plays a prominent role. Janet will also have two quilts made in the eighties, while living in Houston, in the new book LONE STARS III: TEXAS QUILTS TODAY. 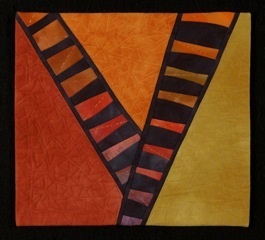 The quilts will be on display at a special exhibit at the International Quilt Market/Festival Houston 2011 in November. The two large pieces are Reflections at Sunset (made in 1987) and Spiral Progression (1988). They will travel for the next year to other exhibits. 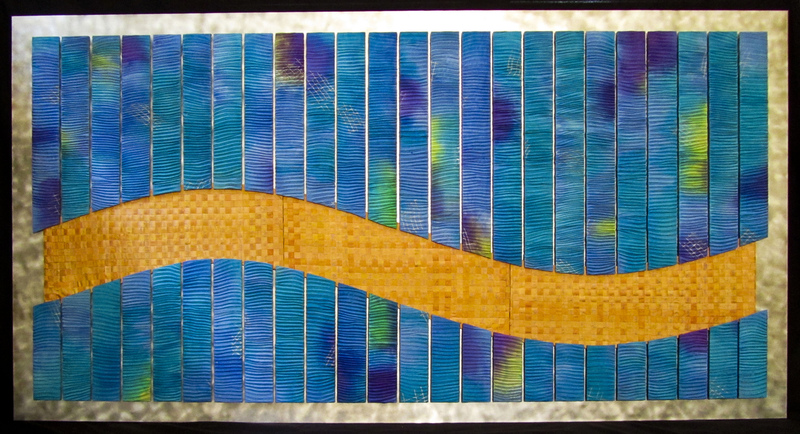 And if that isn’t quite enough, Janet will also have a piece in Quilt=Art=Quilt to be held at the Schweinfurth Memorial Art Center in Auburn , New York. The show will run from October 30, 2011 – January 8, 2012. Ann Maki Needs Your Vote ! 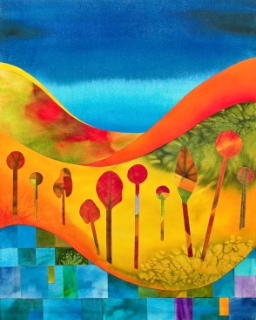 Ann Maki’s “Jelly Beans” was selected as one of six finalists for the City Arts Magazine Fall Art Walk Awardas one of their favorite pieces displayed over the last few months in Seattle. That means she is nominated to win $1,000 and a profile in an upcoming issue of City Arts (print, online, social media etc) and we know how valuable that is. The winner is chosen by the public at a party happening on Sept 29th on Capitol Hill at FRED, 127 E. Boylston. Ayone who attends gets to cast a vote, so they are encouraging Ann to bring as many of her fans, friends and family as possible and to stack the votes in my favor. The party starts at 9pm and the winner will be announced around 10:30. There’s a DJ, free beer and a full bar, killer visual projections on huge walls, and admission is free when you RSVP. It’s a really fun night and is sponsored by City Arts, Blue Moon Beer, 4Culture and SeattleArtWalks.org. You can RSVP on Facebook, or by emailing promos@cityartsmagazine.com with Art Walk in the subject line. Please RSVP and go vote for Ann’s “Jelly Beans”! 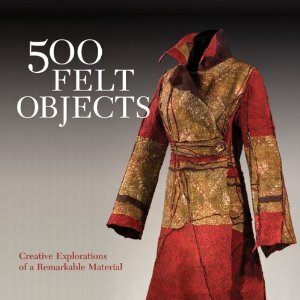 500 Felted Objects just published. Whidbey Island SDA member Marianne Burr is pleased to announce the release of the new Lark book 500 Felt Objects which includes two of her hand made felt pieces. The book presents beautiful photos of the wide variety of objects being produced by felt makers from tiny adornments to room filling installations. This book is just full of inspiration and has just been released to bookstores and on-line distributers.